My firstborn basically lived on me in an infant sling for the first 18 months of her life — due to her severe acid reflux issues and my decision to practice attachment parenting. I’m now pregnant with my second child, and due to the onslaught of recent baby sling recalls, I have decided to go the route of a more ergonomically correct option for babywearing. Enter the impeccably crafted ERGObaby Organic Baby Carrier. “ERGO” is short for the ergonomic design inherent in this cream de la creme of all baby carriers. The ERGObaby carrier totes tiny newborns to toddlers weighing up to 40 pounds in pure comfort for both wearer and passenger — and it may be worn with ease in a variety of ways including front, back and hip positions. If babywearing is the route you’re taking with your child, read on to see why an ERGObaby organic carrier should become part of your daily repertoire. In addition to being stylish and green, ERGObaby carriers truly boast the most well executed design of any baby carrier on the market. 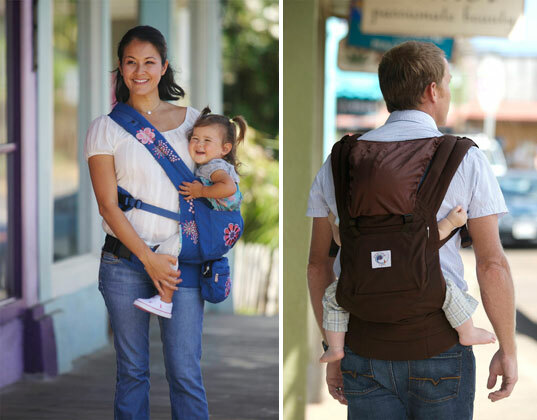 These carriers include all of the bells and whistles necessary to pull off the sometimes physically taxing undertaking of toting baby, but they remain streamlined and effortless in their functionality. One of the features I love the most is the adjustable elastic sleeping hood, which grows with baby and which comes in handy in a multitude of situations — to cover baby as he sleeps, to protect baby from germs while on the go, to keep out bright light, to shield from light rain, etc. I also like that the hood makes this upright carrier akin to a sling for privacy and womb-like factor, but that it keeps baby in a safe position that doesn’t compromise his airway. In addition to baby’s safety, comfort and security, one of the most vital aspects of babywearing is back comfort for the wearer. ERGObaby carriers ensure all of the above. The carrier is designed to support the correct sitting position for baby’s hip, pelvis, and spine growth, and moms and dads will be thrilled with the fact that their back integrity won’t be compromised when wearing baby in an ERGObaby carrier. 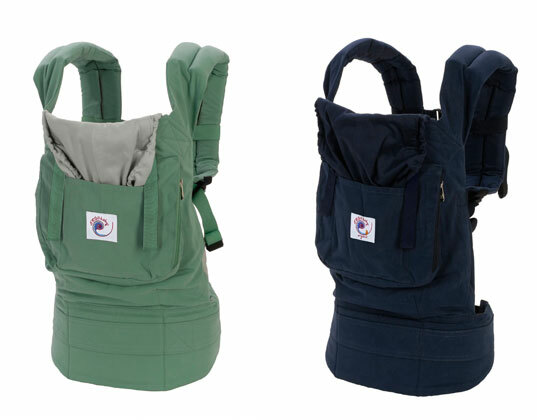 The carrier’s design distributes the child’s weight evenly, and the extra wide waist support, plush padding on the shoulder straps and properly positioned, extra secure buckles enable parents to wear baby for long periods of time without experiencing any painful repercussions. ERGObaby organic baby carriers feature 100% organic cotton twill with 100% organic cotton sateen lining and hood, and 100% organic cotton batting in the body of the carrier to soften its edges. To accommodate newborns, ERGObaby offers a 100% organic cotton fabric/lining infant insert that may be worn inside the carrier, and should be used in tandem with the carrier until baby is four to five months old to properly support the baby’s developing head and neck. 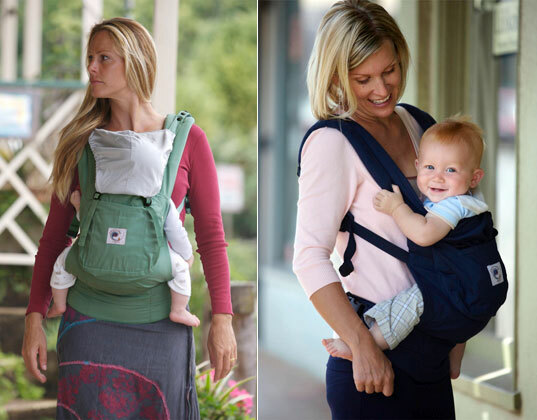 I have worn many, many baby carriers as an attachment parenting mom and in my line of work as an editor/writer in the green baby design niche, and I can say without a doubt that the ERGObaby organic baby carrier is by far the most superior in all aspects. It is eco-friendly, baby- and kid-friendly, parent-friendly and back-friendly! So take my word for it and save the time researching baby carriers and take a nap with your baby instead! 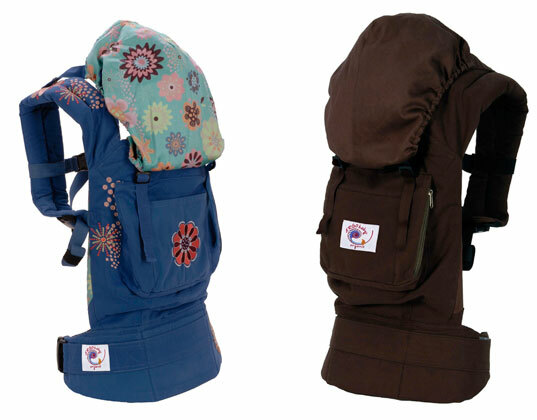 ERGObaby organic carriers come in a variety of color options and styles and the company also offers many organic accessories to further accommodate your babywearing needs. Love this carrier. Experimented with wraps, slings and other carriers but found that my 6 week old was most comfortable in the Ergo. We use the infant insert as well which is super snugly and provides support for the head and neck. I loved mine and so did my little girl. For those on a budget this can be expensive, although it is worth every penny, getting a deal is always appreciated. A friend suggested that I call the company- they give deals on Ergo's that were returned- could because they did not like the color or they got 2 of them or something was wrong. So if you are on a budget give the company a call and ask if they are still doing this. We absolutely love our Ergo carrier! I gave in and bought one when my daughter was 14 months old - and it's already proved a lifesaver. Now that she's walking - getting through any public experience s 10 times easier with her calmly strapped to me than wriggling to get free and get down and cause mayhem! Brilliant! My firstborn basically lived on me in an infant sling for the first 18 months of her life -- due to her severe acid reflux issues and my decision to practice attachment parenting. I'm now pregnant with my second child, and due to the onslaught of recent baby sling recalls, I have decided to go the route of a more ergonomically correct option for babywearing. Enter the impeccably crafted ERGObaby Organic Baby Carrier. "ERGO" is short for the ergonomic design inherent in this cream de la creme of all baby carriers. The ERGObaby carrier totes tiny newborns to toddlers weighing up to 40 pounds in pure comfort for both wearer and passenger -- and it may be worn with ease in a variety of ways including front, back and hip positions. If babywearing is the route you're taking with your child, read on to see why an ERGObaby organic carrier should become part of your daily repertoire.